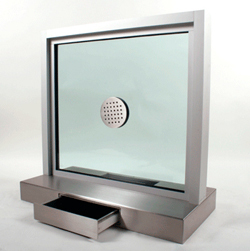 Where The World Can Find Security Products For Less !!! one full height and one secured above the package pass-through. shelf is 2 inch thick. 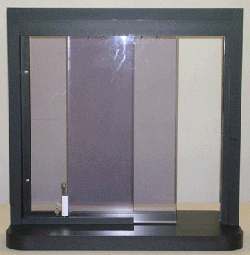 Night Service Window is of the kind frequently used for motel registration or 24 hour service station windows. 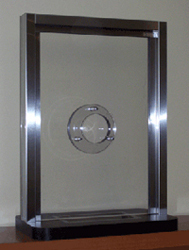 The 16 gauge stainless steel housing is glazed with 1-1/4 inch Level One Bullet Resistant Acrylic. 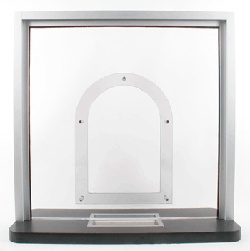 with a top measuring 14 " 3/16 inch wide x 18 inch deep from customer to clerk x shelf is 2 inch thick. 24" X 36" 30" X 36" 30" X 42"
36" X 36" 36" X 42" 48" X 36"
48" X 42" 60" X 36" 60" X 42"
72" X 36" 72" X 42"
This unit has an aluminum tubular frame with a plastic laminate base, recessed cash tray and 14" X 14" X 14" clear acrylic package receiver. Voice transmission is through a natural acrylic talk thru. 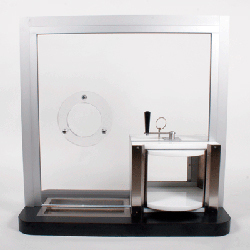 This unit has an aluminum tubular frame with a plastic laminate base, recessed cash tray and rotary package receiver. Voice transmission is through a natural acrylic talk thru. 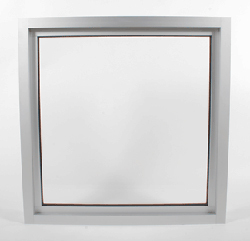 This unit has an aluminum tubular frame with a stainless steel base and recessed deal tray. 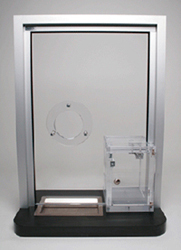 This unit has a stainless steel tubular frame with a plastic laminate base and recessed cash tray. Voice transmission is through a natural acrylic talk thru. 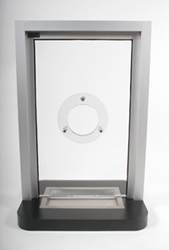 This unit has an aluminum tubular frame and plastic laminate base with a recessed deal tray. The unit has one stationary lite and one sliding lite. This unit is for interior use only. 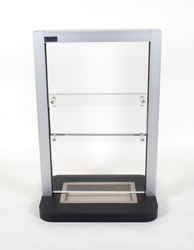 Note: some of these exact models pictured have been discontinued or may not be in stock or even available, however we can configure transaction windows to certain specification that you like, however these pictures are for example purposes only and may not exactly resemble the model you order depending on the frame size, color , rounded shelve corners , dimensions and finish, as well as different types of speak thru options, level 1 level 3 amplified etc.